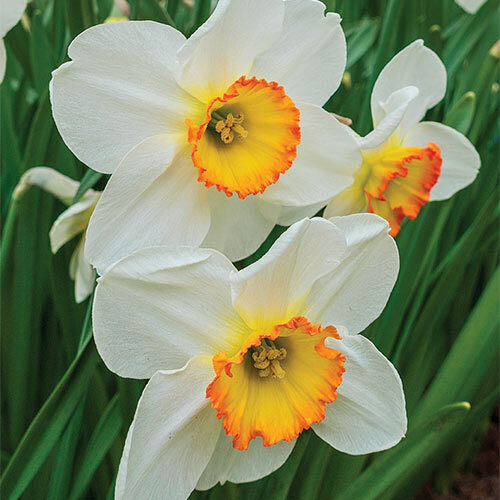 Introducing an award-winning, large-cupped daff perfect for creating colorful naturalized plantings and large floral showings in the landscape, or adding bright, bold hues to seasonal beds, borders and bouquets. Flower Record is an heirloom variety that dates back to around 1940. It reliably bears big, fragrant blooms of white with large, vivid yellow cups trimmed in deep orange to red. The brilliant colors, along with the classic, large-cupped form make an outstanding sight in a mass planting, too! An exceptional naturalizer, it reappears with increased beauty and vigor year after year. Daffodils are very easy to grow, tolerant of many soil types and deer resistant.